Successfully Added AbleCam - 5MP Waterproof Digital Camera (Face Detection, Image-Stabilization) to your Shopping Cart. 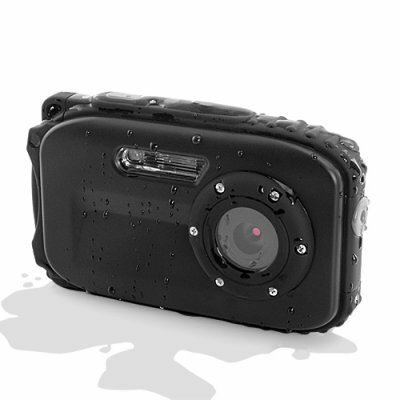 : Capture sharp digital images and beautiful videos rain or shine with the AbleCam Waterproof 5MP Digital Camera. This special Waterproof Edition lets you take colorful and lively pictures while completely submerged in water, making it more than ideal for rainy days, swimming, your next fishing trip, and any other fun water activities. See the world in a whole new light with the AbleCam Waterproof Digital Camera. Able to withstand complete submersion in water to up to 3 meters, this 5MP Digital Camera is great for your next trip to the beach and for amazing underwater photography. Afraid to take your ordinary camera out during rainy days and pool parties? Never again, the AbleCam Waterproof Edition says bring it on. The AbleCam digital camera also features a 2.7 inch LCD view screen for a more comfortable picture taking experience and many unique features you would usually find in a mid range Sony and Canon digital camera, like face detection, Pict Bridge Compatible, Anti-Shake Image-Stabilization and more. But most best of all, this digital camera is available at budget- friendly wholesale price and can be used by anyone! Whether it's swimming, rafting, fishing, hanging out by the pool, or being used during rainy days, the AbleCam Waterproof Edition is ready and available to take all of your favorite memories. In stock now, get yours at an amazing factory direct wholesale price from the leaders in wholesale electronics, Chinavasion. Shutter Speed: Normal 1/2 sec - 1/1000 sec. Night scene: 3 sec - 1/1000 sec. Does this Digital Camera come with a self timer? How many Scene mode I can choose? we provide almost 10 kind of different modes. Can I record voice when taking video? Yes, open the cap when you don’t use it underwater. Otherwise, you need close it when you use it underwater.